Regular readers of my blog may have noticed that for a period of several weeks earlier this year each every single post I created had the name "Bill Kurtis" weaved into it somewhere. I thought it would be an interesting experiment to see if anyone would notice it and call me out on it. Curiously, as far as I know only three people did, and one of those people was me when I was in a hazy, suggestible state having not slept for two nights and I didn’t realise I was reading my own blog. I guess most of you chalked it up to my regular pointless and largely irrelevant banter. Good times! Some people say the US government… covered it up. I’m Bill Kurtis! 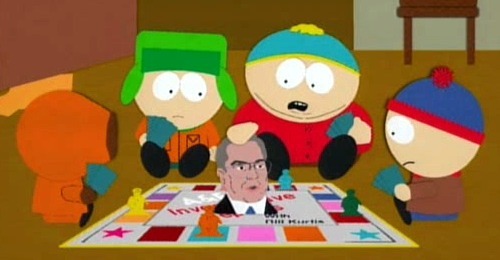 For those who don’t get the reference, Bill Kurtis was parodied on an earlier episode of South Park. In the show the boys are playing a conspiracy board game called "Investigative Reports with Bill Kurtis" where each turn they have the choice of covering up an event, or denying it. They then press the bust of Bill Kurtis in the centre of the board where a verdict is spoken by Bill Kurtis, with him introducing himself as Bill Kurtis at the end every time. After watching this episode you couldn’t walk into our house without being greeted by someone claiming to be Bill Kurtis! An inside joke that you would have had to watch that episode to get? Absolutely! But then again I really dislike it when I read dry blogs without anything spontaneous on them, and besides. Besides what? Exactly! (Another South Park reference). It was fun while it lasted, but no more will any of my blog posts contain a declaration that I am Bill Kurtis, or that I’m not Bill Kurtis. Which is a relief, because I’m not Bill Kurtis. On a somewhat related note, this post will be the first to use my newly created and ridiculously verbose tag seemed like a good idea at the time. I get the feeling I would have used this much more often on many other posts over the years had it been available! The far too long tag has already been used once. I smell cooking onions. Is someone cooking onions?